Lufthansa passengers flying from Frankfurt to Dubai on flight LH630 were the first to experience the airline’s new prototype VR Moving Map, while on board the Airbus A330. Passengers wearing special VR glasses were able to view the moving landscape below them as a 3D map and even take part in 360° virtual excursions as they immersed themselves in places of interest. As the aircraft flew over Vienna, some passengers virtually rode the Prater Ferris Wheel or even had the chance to virtually attend one of the city’s famous classical concerts. The prototype was developed by Lufthansa in cooperation with 3spin, Lufthansa’s lead agency for virtual and augmented reality. “Gazing out of the window, I have often thought to myself: Where are we and what is going on down there… Our idea is based on that thought. 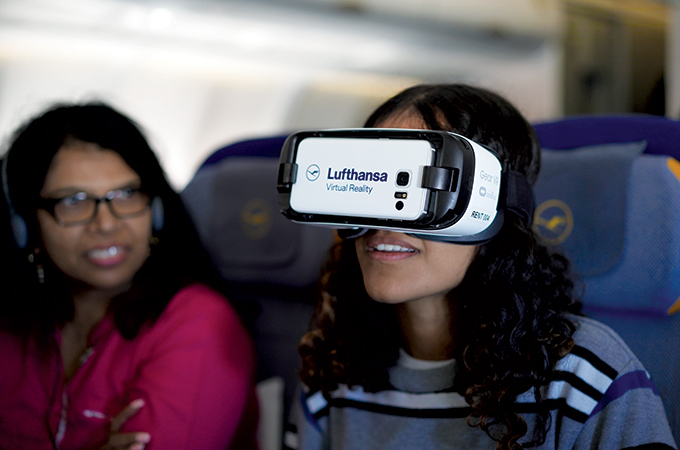 In order to help passengers experience the world below we have developed the VR Moving Map in collaboration with the Lufthansa Customer Experience Team,” said Thomas Hoger of 3spin. Previously, this VR technology was offered to customers on the ground. By giving passengers on this flight the chance to enjoy 30 minutes of virtual reality content, the airline aims to understand passenger interest in this topic and gather their feedback on the trial. Passengers trialling the VR experience on board all found the technology to be a welcome addition to the existing In-Flight entertainment program. The airline will continue testing various possible applications of VR and AR with customers to evaluate together with relevant stakeholders which prototypes could be developed further.